When the end of summer and winter approach is when flu finds its way in. This time a year ago I had just finished the book I had been working on for the previous two years. I was burning the candle at both ends, I was spent and not taking care of my self at all well. I got a very debilitating dose of the beastly Australian flu that effected so many so badly. I have to say, I feared for my life, a first for me.This has made me much more conscious about doing better by myself this year. Here are a few things I am doing which may also be useful to you. 101 is of course to eat a wholesome wholefood diet, get plenty of rest and don’t overeat! This because, preventition is far preferable to the need for cure. If you have read my newsletter you will have seen that for the past month I have been following a program of intermittent fasting and I have been addressing getting more sleep of better quality. When I am eating, I am being conscious of eating mostly cooked wholefoods, from every food group but with an emphasis on dark leafy greens and lots of rainbow vegetables at every meal, fermented condiments and drinks three times a day and small amounts of wholegrains and legumes, which I am cooking in bone stocks. If eating proteins these will be cooked in or include animal fats from pasture raised animals to ensure adequate amounts of fat soluble vitamins A, D, E, and K. I am eating less added sugars and no refined carbohydrates to give my immune system the best chance to ward off what it may be exposed to. Plenty of garlic, ginger and a little fresh turmeric are appearing frequently too and as it is citrus season there is lemon or lime juice in abundance too. The jar above contains my umeboshi plums, which I made last year, they keep for years and are my first port of call if I feel a little under the weather. 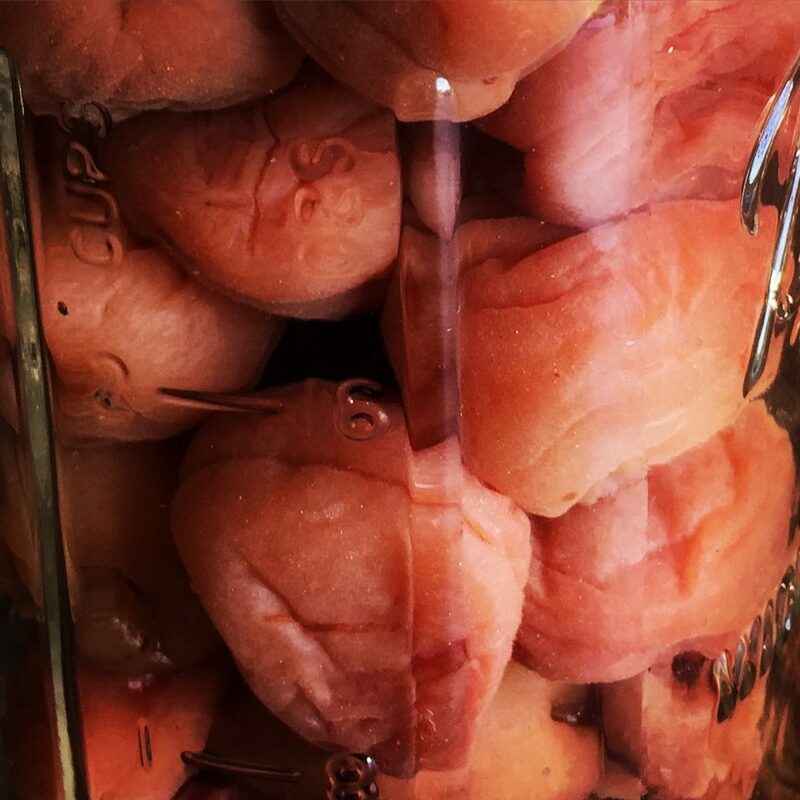 I use them to make am umeboshi kuzu drink, a Japanese remedy for any overly acidic condition, exhaustion, vagueness, a headache, nausea and that first sign of going down. 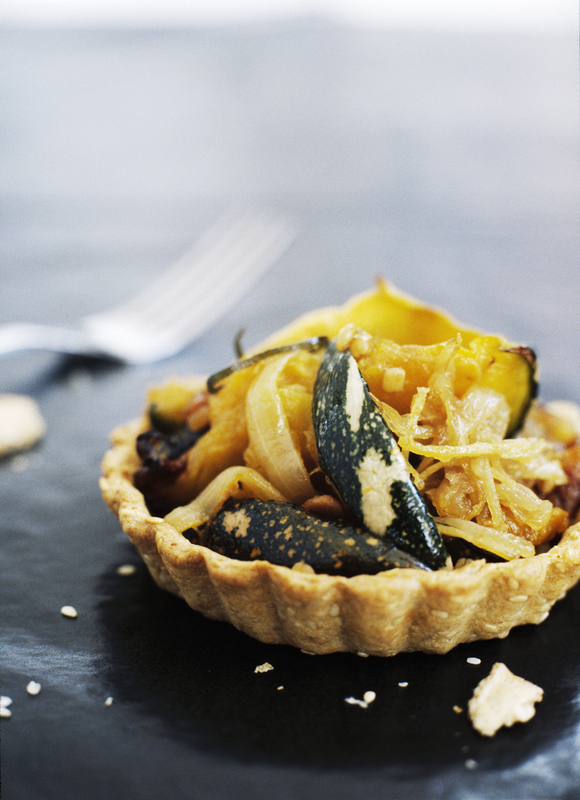 There is a recipe for this in my first book Nourish, let me know if you’d like this recipe and I will post it here too. If I feel the first inkling of a common cold, scratchy throat or sniffle. I reach for one of the supportive remedies below. I may gargle with a few drops of tincture of myrrh in warm water or 3 drops of oregano oil in warm water, the latter leaves me smelling like pizza butI find it incredibly useful and effective, neither are pleasant. Food grade oregano oil is quite dear too but a drop or two is all that is needed and a bottle this size may last me a few years. As it is an oil heat, light and oxygen will deteriorate it, so store it in a cool dark place. Armaforce tablets can also be very immune supportive but my go to most loved assistant is this Chinese herb preparation Yin Quao (yin chow), the same formula may be found in a health food dispensary under the name Clear the way. 5 pillules taken as soon as you feel the first influence of an intruder, followed by the same dose twice a day can be the difference between succumbing or not. This remedy may be both prophylactic and preventative, if taken soon enough. If it is achyness and that dragging sensation that often precedes the flu that I feel, I reach for the wonderful French homeopathic remedy with the totally unpronounceable name seen below on the right. Follow directions for its use and again, for this to be effective you need to get it at the very first signs. Stay well my friends and if not, my advice is to STOP, do nothing, stay cosy and say yes to whatever is offered to you by those that love you. Jude Blereau was staying with me when I got sick last year and it was her care that enabled me to attend my book launch. For which I am eternally grateful. Nothing in this post is meant to replace professional medical advice. I spent some of Sunday afternoon out at the front of the house curing a new wrought iron sautéuse pan, seen above and below with its distinctive low heat handle sporting a stylised Australia cut out.. This was a gift from Solid Tekniks who make fantastic seamless Australian wrought iron pots and pans. Wrought iron is half the weight of cast iron, which I will greatly appreciate. It takes a bit of time to cure a pan well but having done so you will have the perfect surface for cooking up a storm forever more. I hadn’t realised how much a fan I was until I gathered together the iron cookware I own and I couldn’t fit it all in the shot! When I look at these above I realise that they each serve me well, for differing purposes, I have acquired these all over time and you could get buy with a crepe pan and a skillet alone and its always good to have an enamelled cast iron pot to make casseroles in because iron and steel are reactive to acids so its best not to cook those in them for long.. The heavy cast iron pot at top left above makes the best grain dishes when using the absorption method, the large steel crepés pan is also perfect for omelettes, galettes, pancakes, dosa or injera flatbreads, The small Dutch oven goes onto the coals in my fireplace to roast a few vegetables or chestnuts when those are in season, the new sautéuse I expect to shallow fry in or make a small stir fry and like the rest it will make, perfect crispy edged fried eggs or something shallow fried and golden, the large skillet works very hard in my kitchen. I bought it for a fiver in my 15th year, at a camping shop in London. When I went travelling, for a year I thought, I left it with Mum and reclaimed it 32 years later, after she had no further use for it. That pan needs resurfacing, as over the years its patina on the sides has gone rather crusty but on the base it was recently stripped of its patina all together by overheating (grrr to those that cook in cast iron on on full blurt!). I call on that pan to do a thousand jobs, sautéing, dry toasting, searing to seal, for fish for a steak… in the foreground on the left is my trusty Mexican tortilla pan the ‘camal’, it produces all sorts other than the best tortilla, it’s good for reheating flatbreads and toasting seeds, the small steel pan I use for mini pancakes, omelettes, frying a single egg or a few mushrooms, finally and if you have attended a bread class with me, you will have tasted the product of my large Dutch oven, it bakes an absolute beauty, those with lids offer a really good seal so the contents steam bake in a hot oven. What all these offer is an even transfer of heat and a little stick? Stick is not a dirty word, far from it, stick is your friend when you are making any of the above. Stick is good but stuck is to be avoided. The means of that is to create a good surface on these pans as soon as you can after getting them home. Being iron or steel, they are subject to rust and rust can ruin their surface and the food cooked on it. After use wash them well but don’t scour, dry well and oil before putting them away. You can see that the surfaces on mine are imperfect but none except the Dutch ovens are rusty, they are because I cook bread at such high temperatures the oil would create more smoke than I care for so I leave them bare. The patina develops with use. When you put ingredients in the pan to cook to a crisp, hold your nerve and let them form a good base before attempting to turn or move them, that way, when you do they will come away with ease and their texture and flavour will be at its best. New steel and cast iron pans are given a coating to stop them oxidising whilst they sit on the shelf waiting for you to buy them. What is used varies but in any case the first thing to do before use, is give them a really hot soapy wash and then rinse well and heat to dry completely. Now you have a bare steel or iron pan, if used now food will stick and burn and rust is certain over time. What is needed is to ‘cure’ the pan by coating with fat. This is very easy and quite fun to do, though doing it well and evenly takes some time, don’t rush, build up the surface in thin even layers. You need a heat source, I like a flame best and preferably outside as you will be burning fat onto the pan and this inevitably creates smoke. A gas barbeque will work well or a fire pit or a simple inexpensive burner such as the butane burning portable stove above. These can be bought in any hardware store these days, for around $25! These are excellent to have for cooking other strong smelling foods and of course, for picnics and camping trips. I find this an ideal means for curing pans as I can secure the pan in a particular position, as seen above and leave it until the surface in that area is evenly coated and then secure it at the next point to get an even surface all over. Here how its done…. You will need a largish clean soft lint free cloth, 1/4 cup say of fat such as duck, goose, coconut or ghee, an oven glove and a large jug of cold water. Wash and dry the new pan, Solid Tekniks don’t coat their pans with toxic substances, so there is nothing but dust to wash off and hot water alone will do. Place the pan over a medium flame until it is hot, dip the cloth in fat and remove the pan from the heat using an oven cloth as some handles get super hot, I was delighted to find that this one did not – good design Solid Tekniks, now spread a thin even coating all over the pan, inside and out including the handle, place the pan over the flame and heat until it smokes and the surface blackens, carefully hold the pan off the heat and pour in cold water, expect furious steam and beware getting in its way, put back on the heat in a new position, heat the pan until it is dry and then apply another thin coating of fat using the cloth, repeat all these steps until the entire pan is blackened with a smooth even patina. wash with hot water and a soft brush and heat to dry completely before taking to your kitchen for use or storage. Once these pans are in use you can use a flat edged wooden spoon to remove excess food from them and them was in wash water with a soft brush. Soak don’t scour, as you will lose the patina and cause worse sticking next time; due to roughing up the surface. I hope you will give these a try and enjoy yours as much as I do mine. Check out stockists and the word from Solid Tekniks here. If weight is not an issue keep an eye out for secondhand pots and pans, they last forever and so can often be found in junk yards, garage sales and the good old op shop. 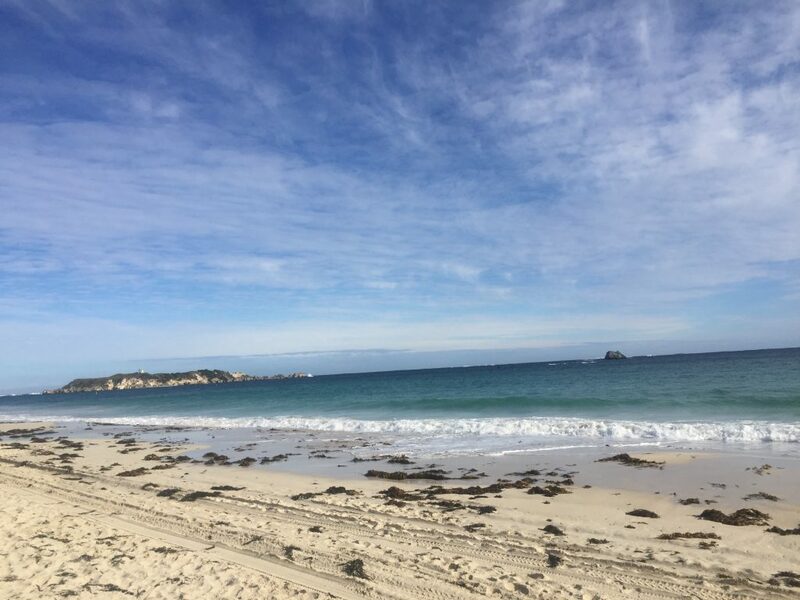 Limestone sand is so very different to the local sandstone sands of Sydney, fine and white it gives the waters around the west coast the most sublime colour, milky turquoise Hamlin Bay, where sting rays come to the shoreline in large numbers. There were none to be seen on this very chilly walk along the strand. Fair Harvest Permaculture Farm was established in 1995 by Jodie Lane’s family. 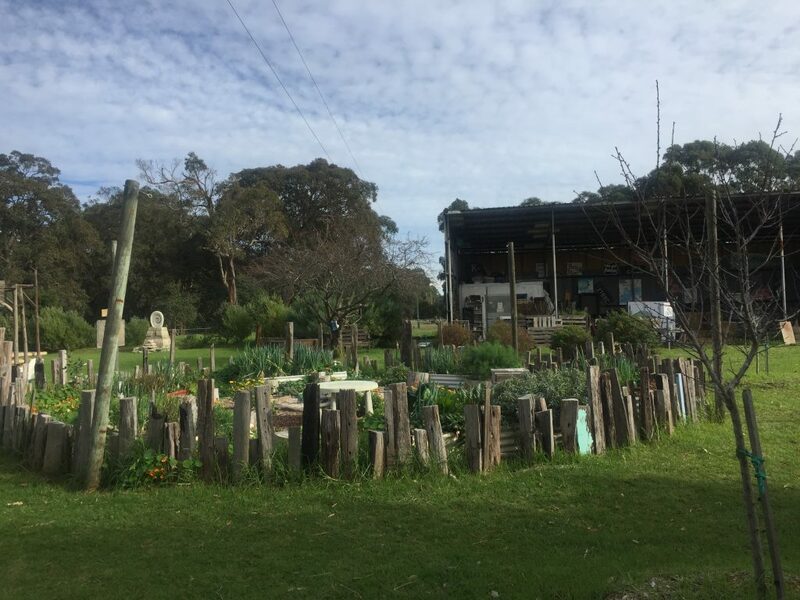 A permaculture system offers immense diversity of lifeforms and operates as a self supporting system, where anything given a home must have several purposes. This would be a very beautiful place to learn the art and skills or simply to visit if you are in the area. Jody and Do work this land now, along with whatever willing workers are abroad. 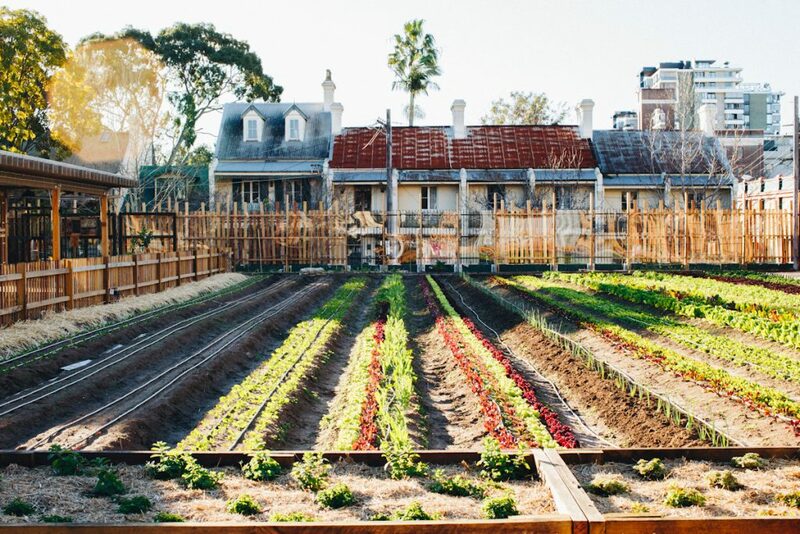 Their aim is to inspire and enable people to grow their own produce and be more sustainable. 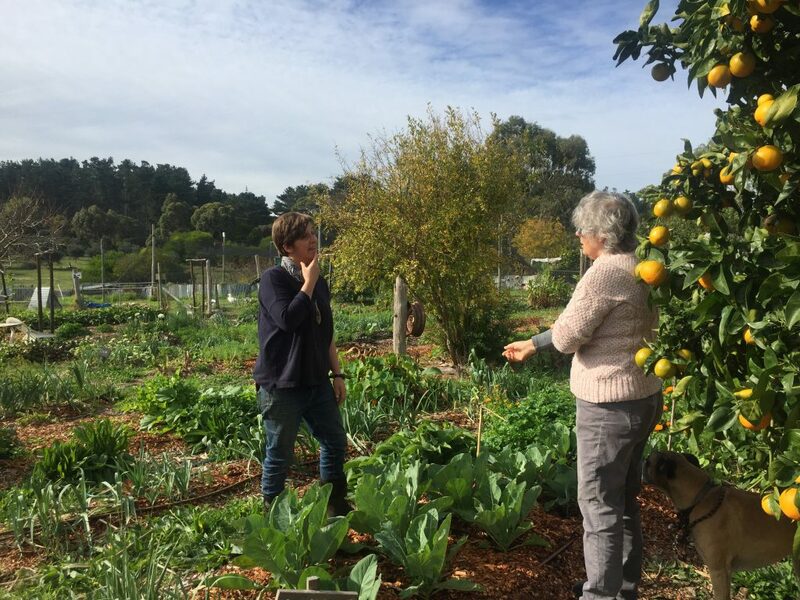 You can book the venue for a course, an event, a wedding or join them on one of their permaculture courses or sustainable living workshops and visit their display farm where you can see their trials, errors and triumphs over the years. They have a fantastically well equipped commercial kitchen, perfect for classes…! A wander around this farm is incredibly uplifting and demonstrates what fresh produce grown with love and care can be. Vibrant, alive pranic food in abundance and beauty. I didn’t want to leave. 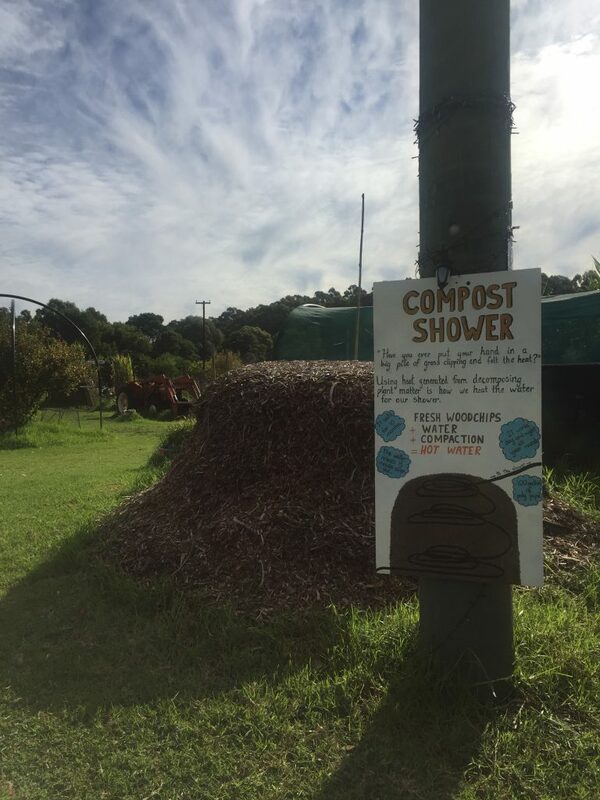 Check out the compost shower system below. Decomposing wood chip mulch heats polypipe buried within and generates heat for as long as 18 months, who knew that such a simple system was even possible? 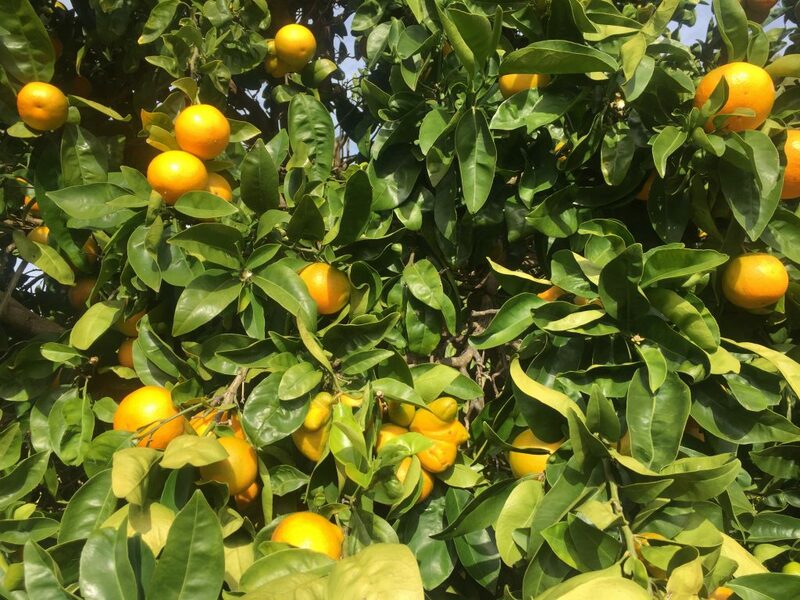 It is citrus season everywhere in the South West, this tree was groaning with soon to be sweet fruit. When you get your hands on such fine specimens I recommend keeping the skins and drying them for later use in marinades, cakes and slow roasted duck or pork dishes. Fair Harvest honeybees produced this delectable honey and the just dug, by hand from loose humus rich soil purple sweet potatoes were moorishly sweet and sticky when dry baked.Those were the last of the radishes and they starred in a couple of the Japanese dishes I made in my Koji and Oden classes later that week. Do and Jude amidst the rows of diverse dark leafy greens, just look at their vigour. The ducks, geese, goats, cows, horses and chickens are fenced out of the garden and yet none the less there were visitors who made their way in, not surprising given the bounty. 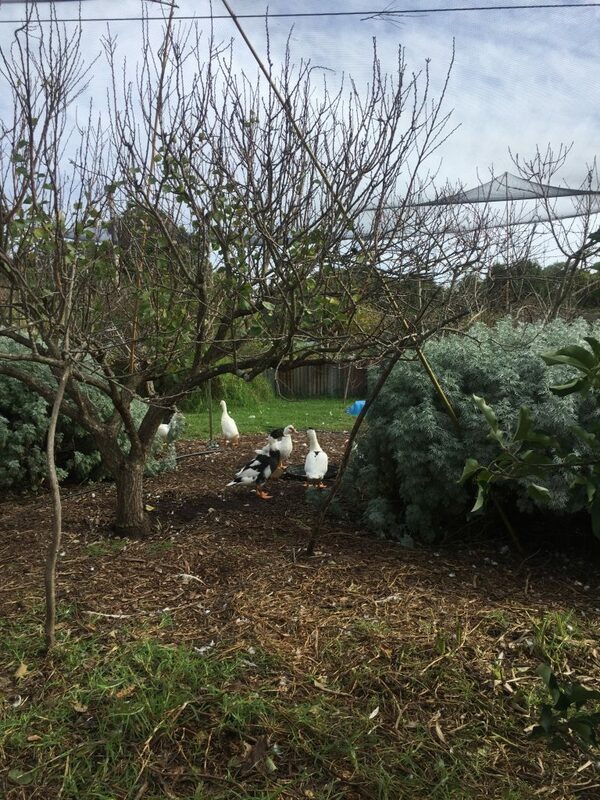 The ducks reside here under the wide variety of fruit trees, Muscovy’s large and well fed. Had our Margaret River classes gone ahead one of these may have found itself in the oven. Though I relish that thought, it would have meant dispatching it myself, never a welcome task, though nothing will make one more grateful for meat. 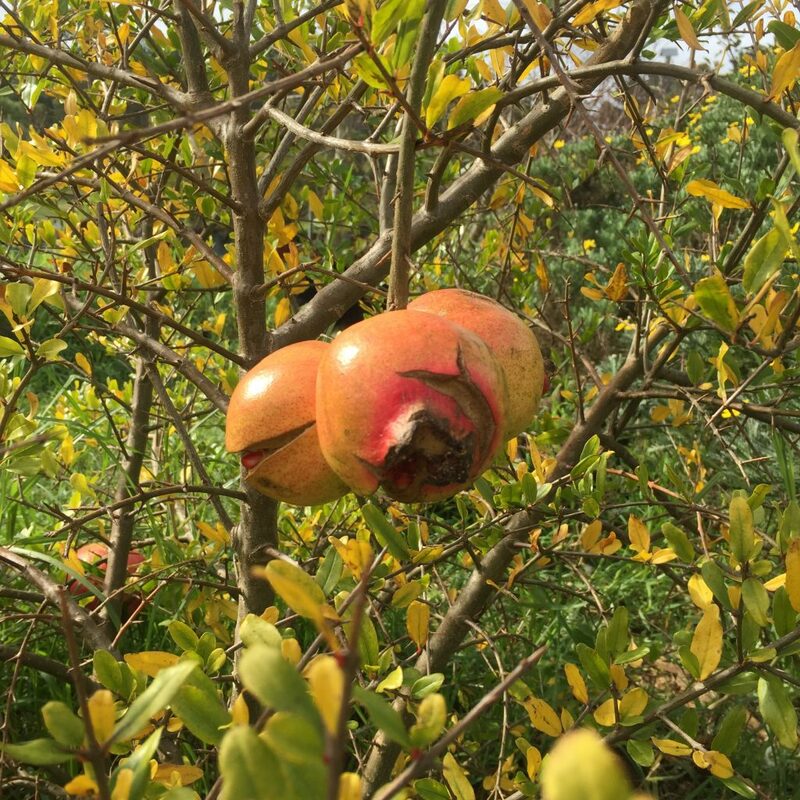 Winters abundant seeds, sweet and sour and oh so pretty pomegranates. 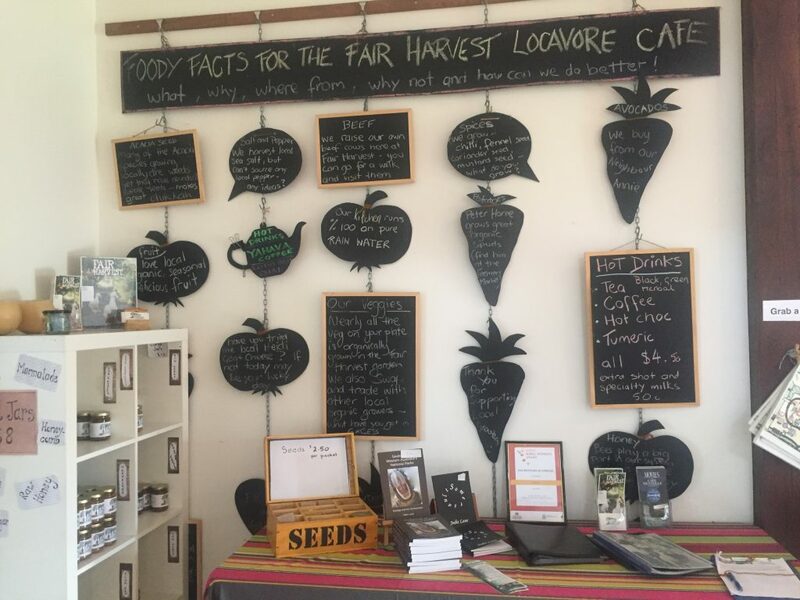 The cafe wall tells of the provenance of the produce used, if it hasn’t come from the farm. Through the month of July Jodie and Do eat only what their land provides them. Seeing what is here that seems very plausible but they really, ONLY use what they can harvest here, they don’t even use their pantry staples, no grains, no beans and even no salt!!! Spending time with these two talented growers committed to wholeness and sustainability, was a highlight of my trip to WA and it has given me pause to consider what I might do differently, that is surely never a bad thing. Back in Sydney I am enjoying the memory of that beautiful place and feel ever more grateful for my local Avalon Community Garden and my association with the fantastic inner city initiative Pocket City Farm (seen above), an inner city farm demonstrating and teaching people in the Inner West of the city how to manage and grow food using sustainable systems. I am going to present there on the morning of August 25th. 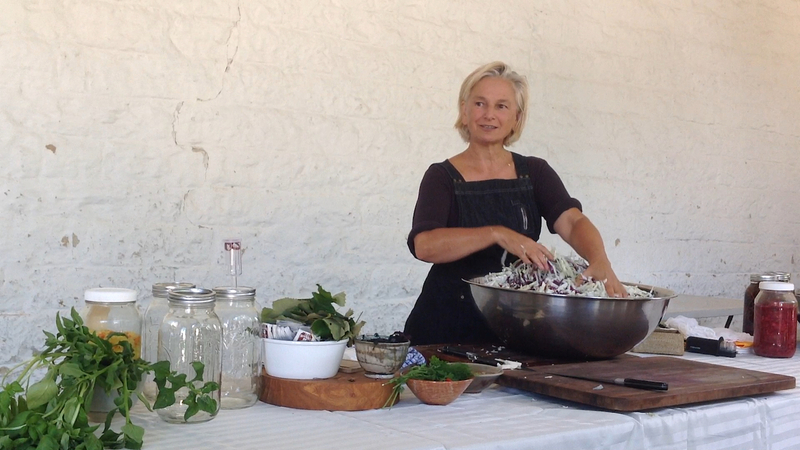 I will be discussing, demonstrating and troubleshooting a range of fermented foods. This is a low cost opportunity to learn something new and if you have an experiment you are unsure about, bring it along to show and tell and I will do my best to provide what you may need to complete it with confidence. Go here for all the details and to book. Samples and good cheer are as ever assured. Fish and flowers were the order of the day I turned sixty! Left and right eye of salmon paintings by Nils Benson who sent these over from his home in LA, cleverly they arrived on the day. 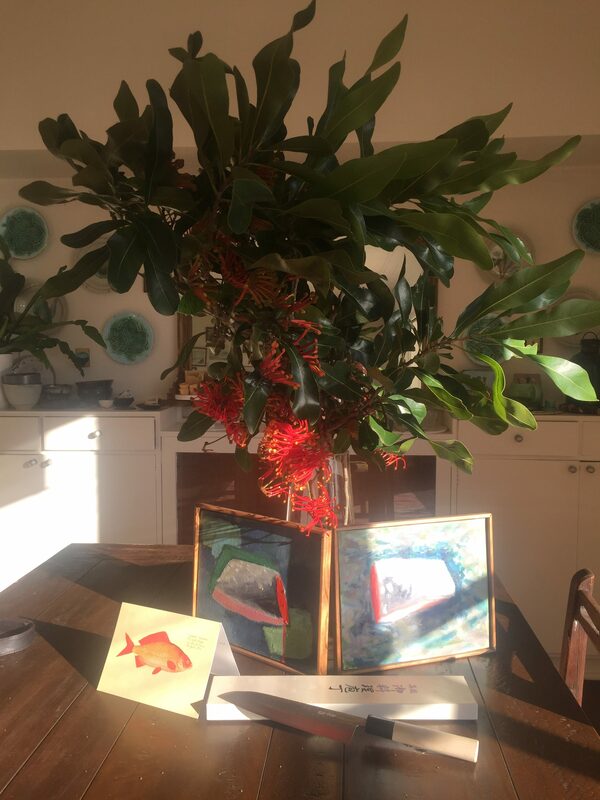 These gorgeous flowers were from me, a celebration of my love of the firewheel tree and the Japanese knife, my gift from India. It felt momentous, to be turning sixty! 60!!! However this birthday will count as one of the best ever. 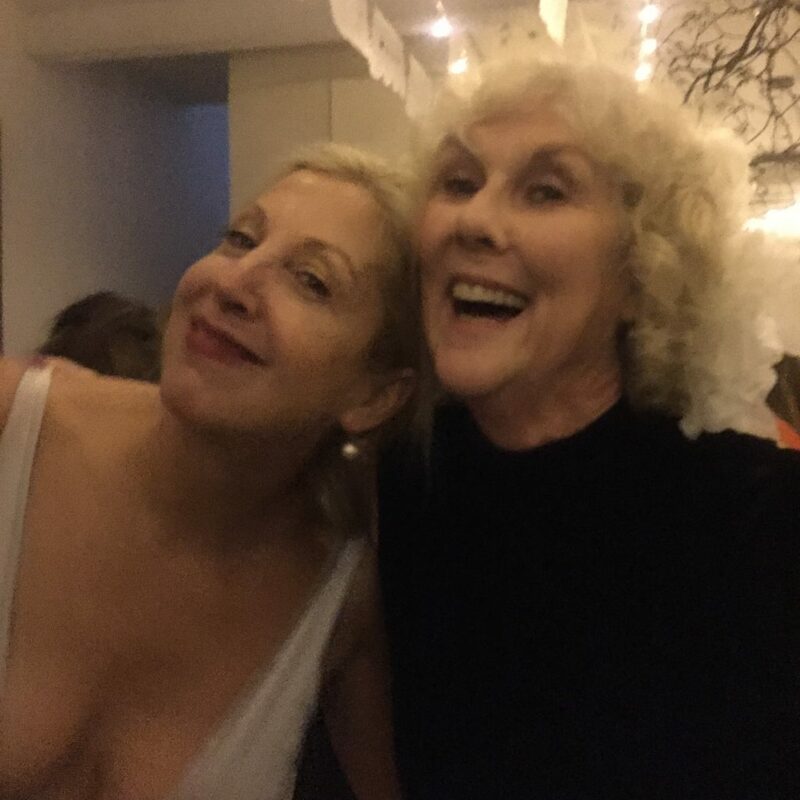 April was busy, lots of work on, lots to work on, a rather significant birthday and my very dear friends Yolande Gray and Martin Teplitzky’s wedding. The wedding date was chosen not to coincide with my birthday and not so that I could cook for it. 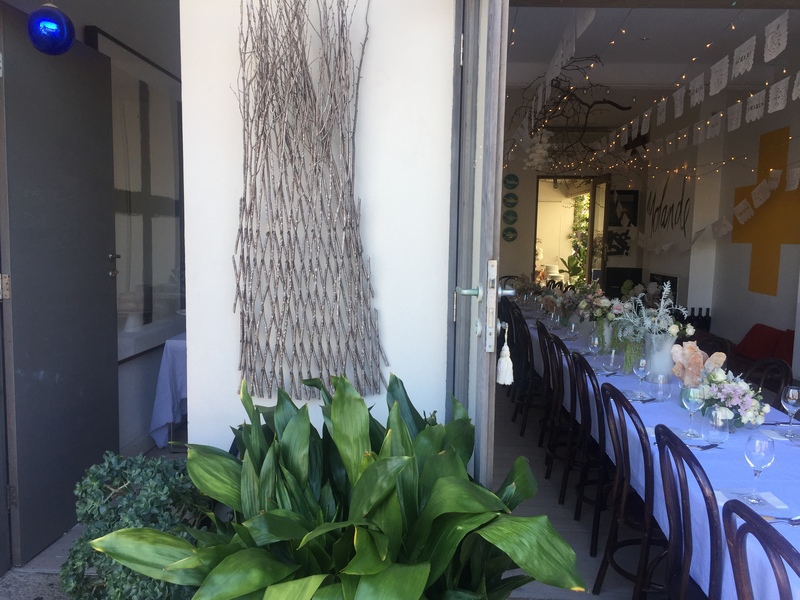 As a caterer it can be tricky, the desire to feed those you adore and the wish to be witness and not miss a moment do not correlate but Yolande being who she is, made everything possible. I shared my birth day with her and a few close friends, we ate together at Fred’s in Paddington. A beautiful meal and a warm and very memorable event. A few days later my daughter flew in from London, to celebrate with me and be here for the wedding. We spent the days prior preparing together and shared the joy that is love for another I made a large batch of Sea Salty Crackers from my book Ferment, which Yolande art directed and designed and the Maple Cured Sirloin, to join the long list of canapés that were expertly served by Friederike Stottolle and her crew. 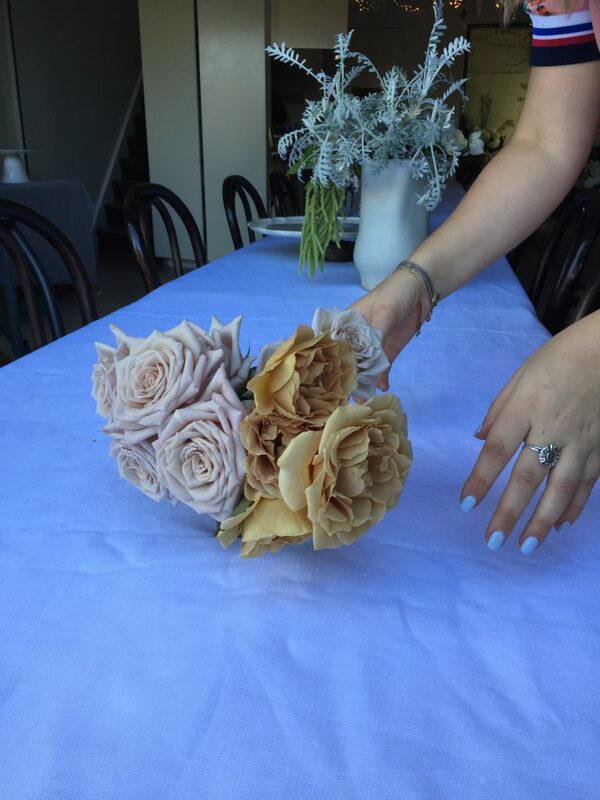 Mr and Mrs Teplitzky Yolande and her much loved aunt Steph India with Mooey’s bouquet Saskia’s artistry with blooms galore above and India’s blue nails with roses below. Yolande and Saskia Havekes are old friends, Yolande designed Saskia’s first book, at the same time that she was designing my first book Nourish. 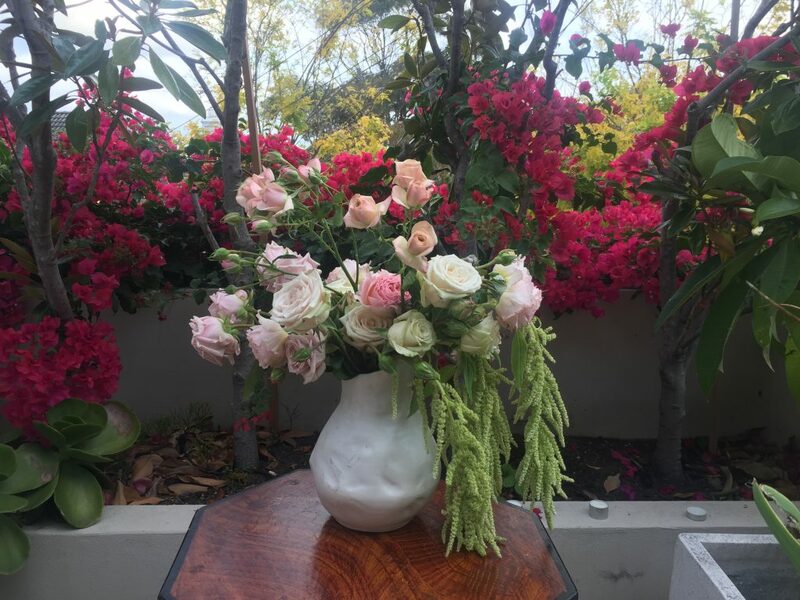 Saskia is the worlds most exquisite florist ‘Grandiflora’ I have made it a link, because if you don’t yet know of their work I am certain you will want to. If you have a need for spectacular head straight there. 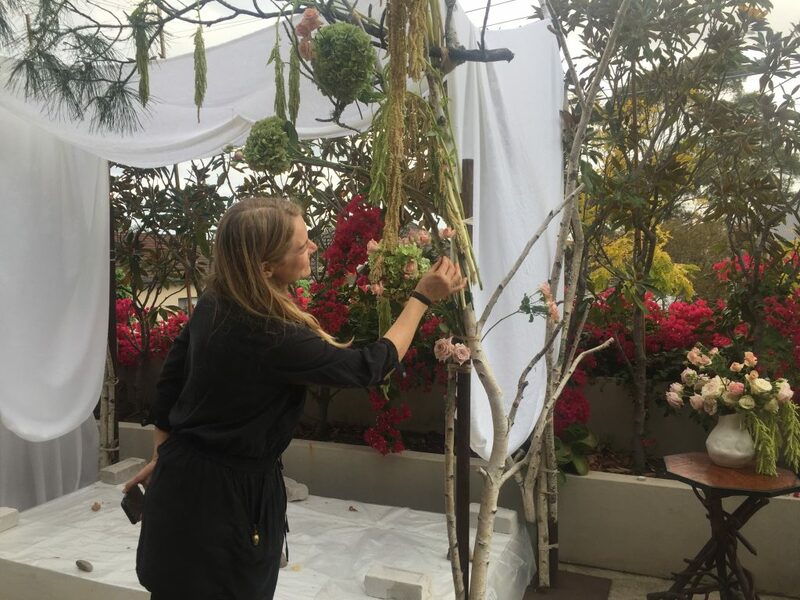 Saskia spent the wedding day transforming the space with divine blooms and then she tasked India with their care for the two days, which is why you see her above with Yolande’s daughter Margot’s bouquet, Margot was busy doing Yolande’s make up, very beautifully. 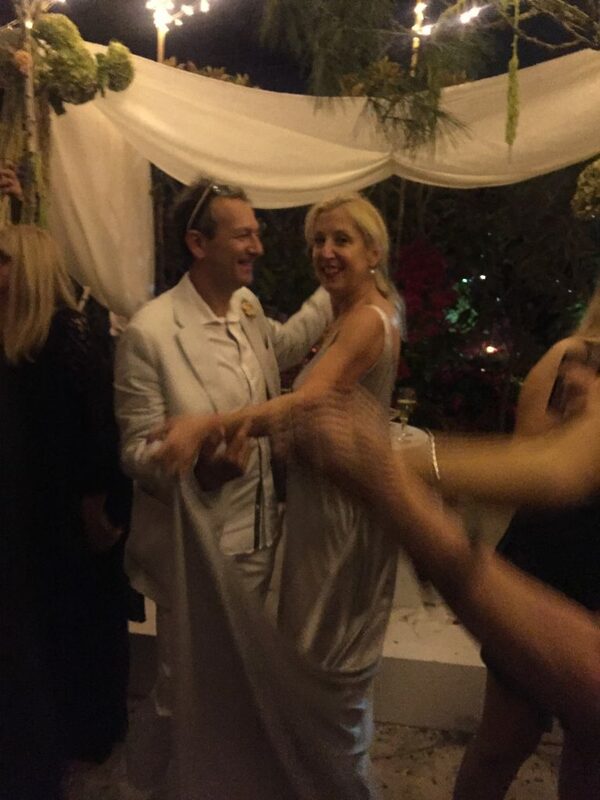 A wedding inevitably reminds one of the joy that love brings and the focus of course is on the love between those who are marrying but what was clear here, was that love was present and expressed by all involved, for days. It was an uplifting, stupendous event, an evening wedding with 100 guests in a not so large terraced house in Bronte. We danced into the small hours and then, somehow, we cleaned up and transformed the space to provide lunch. 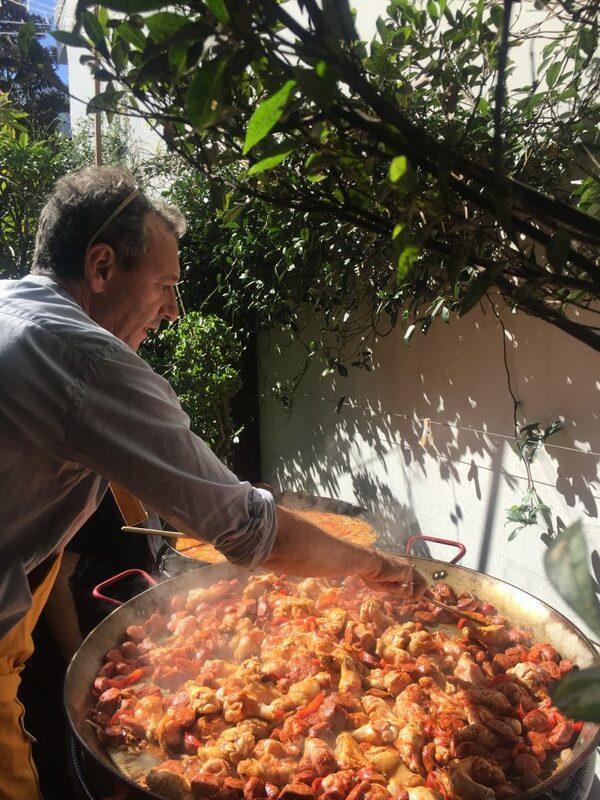 Paella for 58, cooked by chef Martin! – with a little help from his friend (me) and newly acquired brother in law Evan and then CAKE by the fabulous Nadine Ingram’s team at Flour and Stone, also THE place to go if real, irresistible cake is your requirement. All the while, as the entire contents of the ground floor were schlepped in and out of vans and the garage was filled fit to bursting there was laughter, love and continuous support. A tribute to community, caring and what friendship can engender. One should of course not wish it, but could we do that again, it took a lot to make happen but it went so quickly? 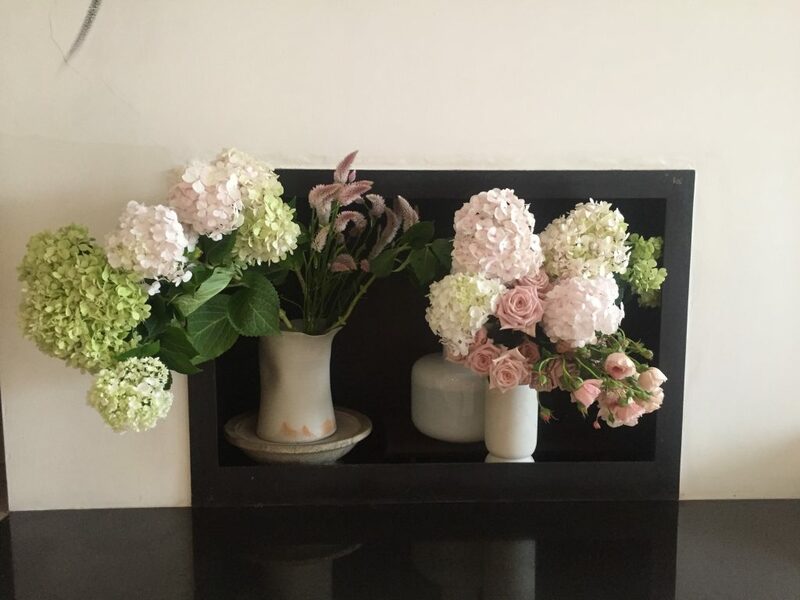 Many blooms came home with me, as the couple went honeymooning, I was not sad but days later I found it hard to let go of the beauteous roses. Would that he had lived, I could have known him better. Last month I turned 60, which means I am now older than my father ever was. None the less, thirty eight years after his death I feel his influences still. 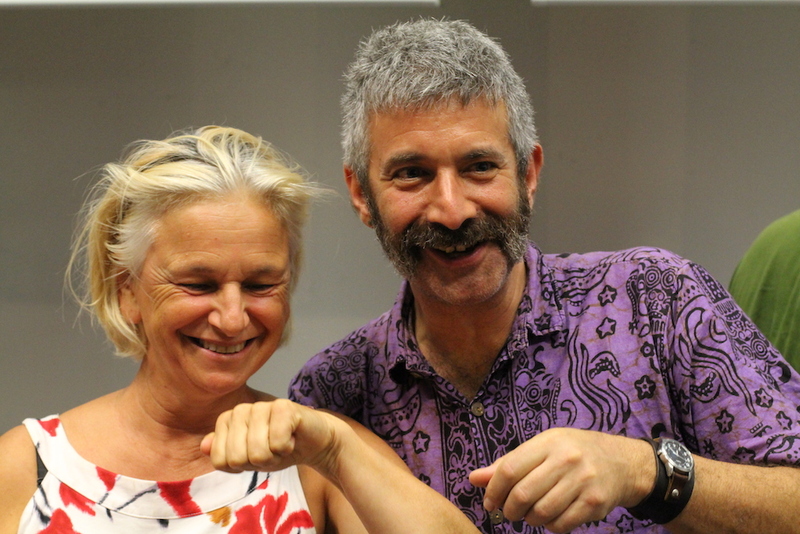 We look alike, though fortunately I have all my hair, we share a sense of humour and many of his merry quips fall effortlessly and frequently from my tongue. I correct my daughters speech exactly as he did mine, “it is ‘used not to’ Holly/India, not ‘never uset to'” and the like. I, like him am a chef, though at 27 he gave up his knife for the law. I refer to him often and wonder how he would have expressed his joy and appreciation for who I grew to be and who his grandchild is. Would he have ventured here? He was frequently a troubled soul, for whom life held many challenges but what I recognise now, is that he upheld his values and gave his all to provide us a full and exciting life, in which integrity matters and every type of food should be tried – for all of which, I am eternally grateful. His suits were tailored, his collars starched, he wore a bowler hat and carried an umbrella as he headed off to ‘town’, a proper English gent he was. Now, clearly a man of an era passed. I celebrate who he was, though I know, I knew little of him really. 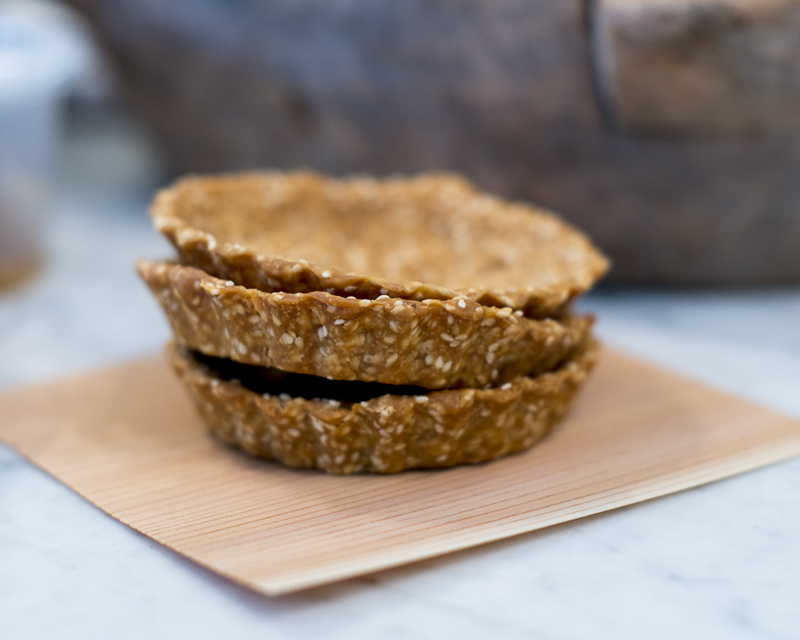 Hot water spelt and sesame pastry – options for autumn or is it spring? The shot below was taken by the clever photographer ©SamanthaMackie at a class I ran way back when, hosted by The Lost and Found Department, when the talented Silvia Noble ran wonderful classes and events. Look The Lost and Found Department up, wherever you are, she has a sublime store in Artarmon and online with that name. She sells the unusual which is, these days, unusual, vintage and lots of beautiful things you may feel you simply must have, be warned! I have a lovely event to cater soon and I chose this pastry for the sweet sticky pumpkin, ginger and natto miso tartlets I will be serving. If you are where it is springtime you might opt fo fill these with a broad bean mash (I always double peel but that’s for you to choose). If you know me at all, you will know broad beans are my all time favourite food, so of course that is what I would be doing were I where spring is raising her warming smile. I have been making this savoury pastry since I opened my first restaurant ‘Manna’ in Sydney, soon after I arrived here in 1983! It stands the test of time and I come back to it because it is so easy to make, needs none of the handle with cool care that pastry usually requires and for any who wish it to be it is easily made vegan. It can be made well ahead, if you be sure to keep them airtight and then when you want them simply fill and serve. Using hot water (boiled filtered not tap!) results in super crispness think crunch and the sesame oil and seeds provide delightful nuttiness but no nuts so you could pop one in a lunch box for school. This recipe can be used to make fabulous crackers too, roll out thinly, slice as you will and bake on a lined cookie sheet as per below. 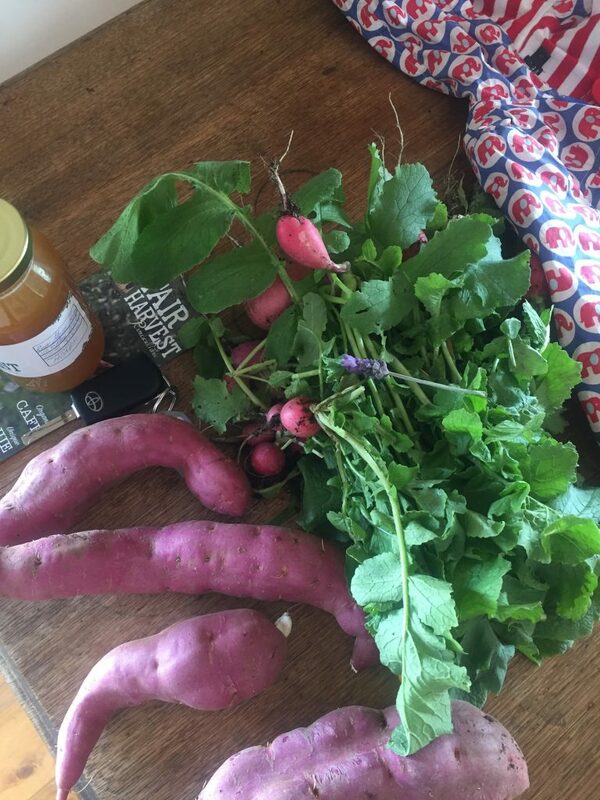 I have given you the pumpkin and the broad bean recipes too. Taking care of the world makes me smile. Enjoy and if you do make them please let me know your thoughts, tell me how they went down, where you are and who you made them for or post a pic on insti and tag me @hollydaviswholefood I am. When it’s too hot to cope, and there have been several of those this Sydney summertime, preparing food can feel like an impossible chore. Fortunately though, in this season there is a bounty of divine produce to eat raw, cured and cooked to eat cold later. If you are growing tomatoes, I expect you’ve been eating masses raw and making sauces for use after summer, if you are not a grower, keep your eyes peeled for the good ones at your local farmers market or providores. 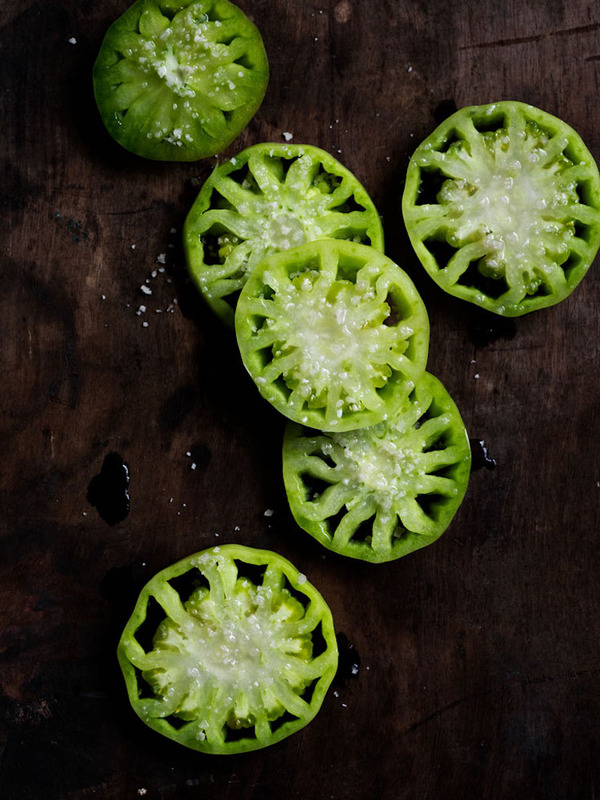 If you see these green tomatoes, an heirloom variety, very pretty with stripes of dark green on their bright green skins be sure to grab a few. They are this colour when fully ripened and not to be mistaken for unripe red ones, which are perfect for fermenting with corn and jalapeño’s, see page 70 of my book Ferment a guide to the ancient art of culturing foods, make some of that now, to enjoy in a few months time, when the only tomatoes to be had are the flavourless hot housed kind. But right now there is nothing like a well grown ripe tomato of any colour. An aunt of mine fed me ripe red tomatoes warm from the vine, in her Lincolnshire garden. 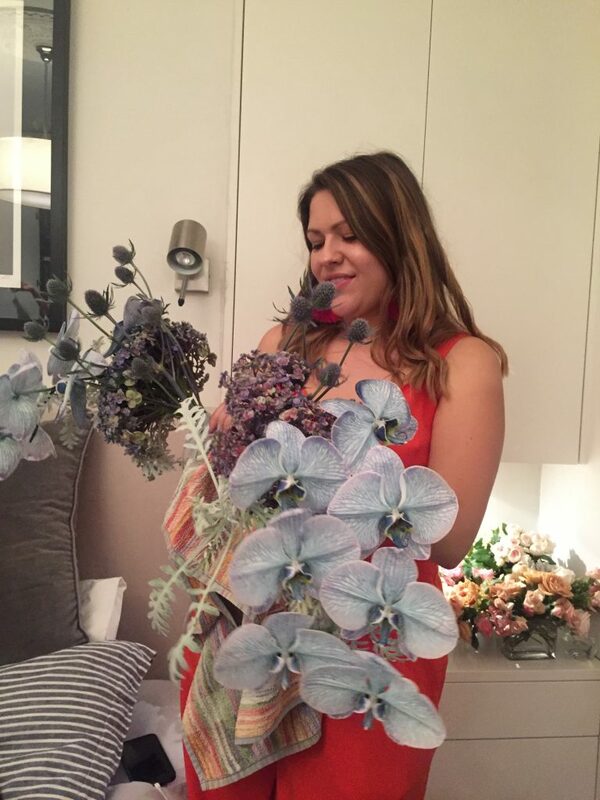 I picked them and she then cut and covered half with a small pile of sugar, a memorable feast I no longer care to repeat but worth doing just once in a lifetime! The image above demonstrates perfectly what a small sprinkling of coarse salt does to vegetables, it draws out their moisture while adding valuable minerals, balancing their acidity and intensifying their flavour. Choose coarse sea salt, the crystal style looks pretty but Celtic is my preferred for its flavour and diverse mineral profile. With a slosh of fabulously fresh walnut or olive oil and a few drops of Jerez or red wine vinegar, a scattering of basil, sage, tarragon or thyme leaves and you have a very speedy, oh so easy dish to make those you feed swoon. A crust of sourdough, to mop up the juices completes the story, if you’re keen to learn to bake your own sourdough loaves or learn more about wholefood cooking and fermenting- check out my classes page here. I have been sharing my crop of summer tomatoes with a pair of very beautiful King parrots, so far we are tolerating one another well and thankfully there are plenty to go round. You can apply the same treatment to a wide range of fresh produce, try celery, fennel, radishes, daikon and cucumbers, alter the type of salt, oil and the seasonings, to keep things culturally related and your set to never cook again! 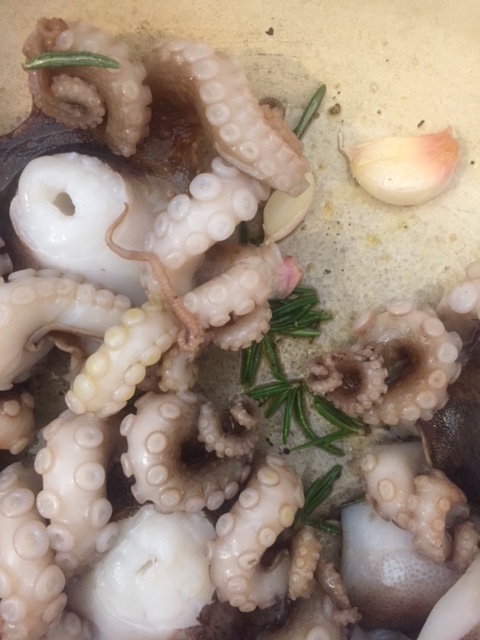 When thinking ‘no fuss cooking’ I am guessing preparing whole octopus does not immediately spring to mind but if you are at the fish markets I recommend buying a handful of small firm whole octopus and cleaning them, so that you can then slow cook them to unbelievable tenderness. Once cleaned, simply toss them in a heavy casserole with a teaspoon of good olive oil, a few garlic cloves a sprig or two of rosemary and a crack of black pepper, lid on, on the lowest heat and left for 11/2-2hrs while you go for a swim, on your return you will have something absolutely sensational, to eat cold over the coming days – it keeps brilliantly, for 3 or 4. 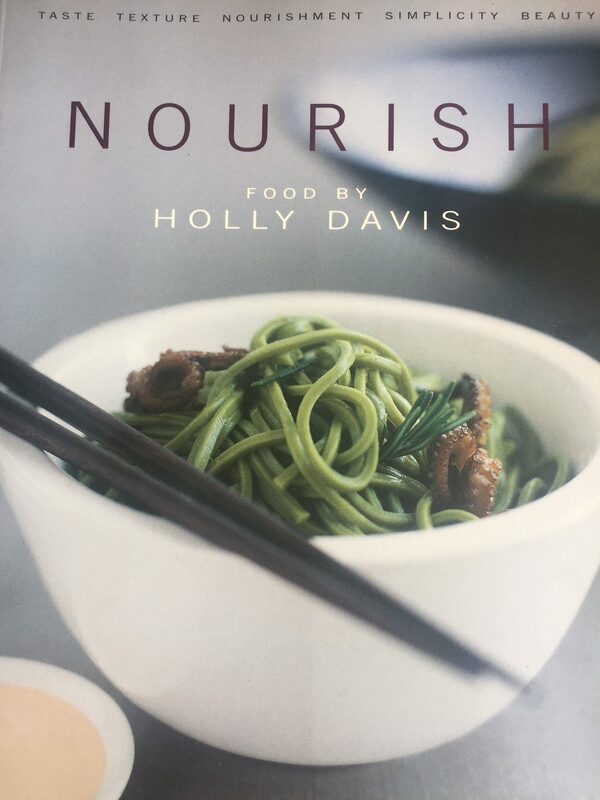 If you’re game, try my signature green tea noodles with octopus, which was the cover image of my first book Nourish, Food by Holly Davis. I served this at a catering job last week and was reminded how much I love this dish and how great it is to have on hand, so I thought I would share it with you. 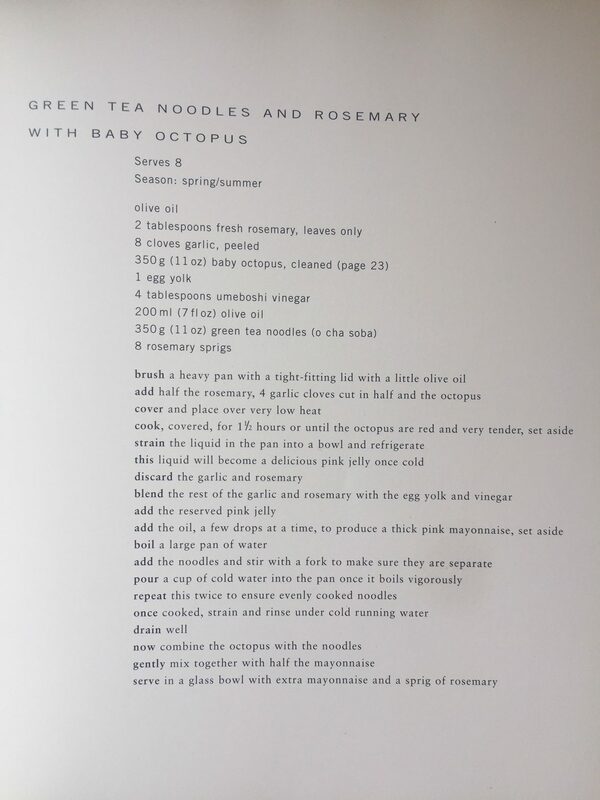 Nourish is out of print, so I am providing images of the relevant pages, how to clean octopus and the recipe. I love to feed people well and enjoy the entire process of creating menus: shopping for the best produce, preparing and serving the food, washing up- not so much and I got good at cooking with the idea that the cook doesn’t have to wash up? Not true, as I seem to spend an inordinate amount of time at the sink. As Christmas is oh so near now, I thought you might enjoy to see a menu I have created for a celebratory Christmas lunch I am catering this week. The menu has been designed to celebrate the season and cater for a broad range of dietary needs. My wish in sharing this is that it serve as food for thought and your own creativity. 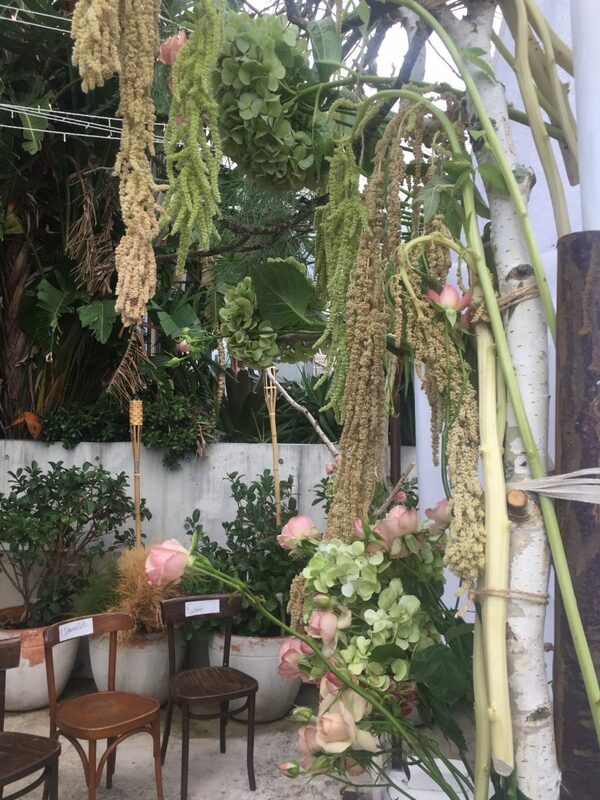 If you are up in Palm Beach NSW through January and you are in need of catering assistance, do drop me an email and I will take on the task, if I am available when you wish. Start the meal with bright, fresh produce, the best quality you can find and afford and then the rest is not too hard. I suggest serving the oysters, marinated tofu and the beet soup straight from the fridge, in small bowls or in shot glasses. 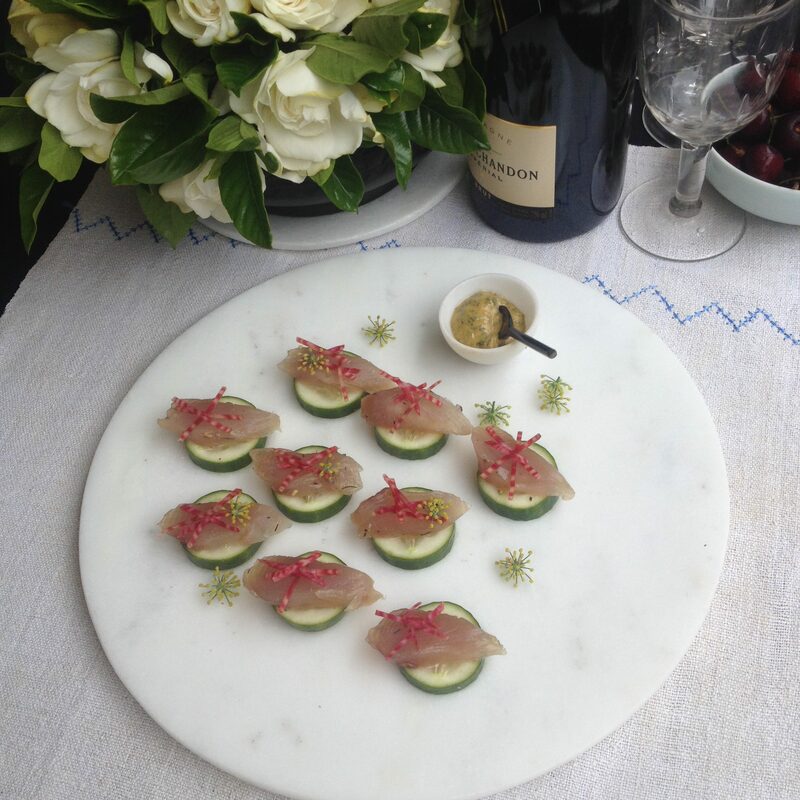 The cured fish is so simple to make and always impresses. Depending on the size of the fillets it need only cure for 2-4 hours or so, then you can brush off the cure, slice and contain until you re ready to serve it. The recipe for this cured bonito is in my book which I might add would make a fine Christmas gift and also on the liveability website where you will find this and many other of my recipes including my fabulous Christmas cake which, you could make this weekend, it is an excellent keeper. Sparkling sake is worth trying, there are several on offer now, a good Japanese grocery or your bottle shop may be able to supply or look online. 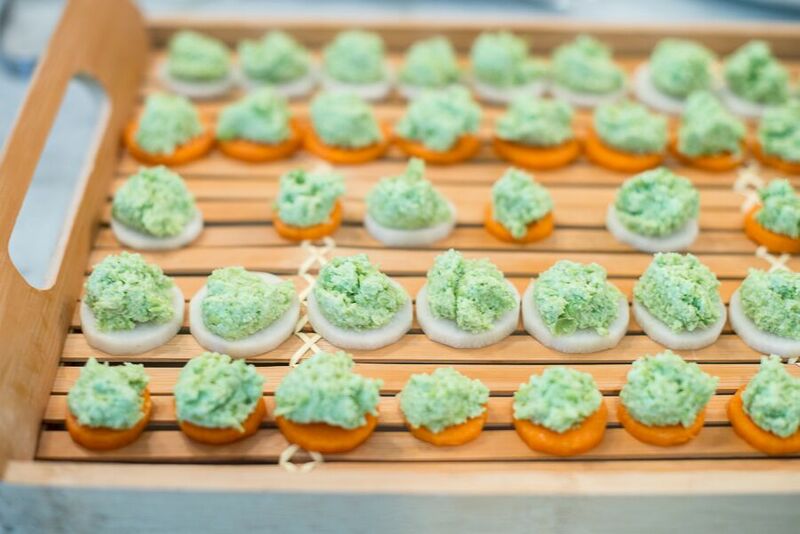 I would choose a dry style and serve just a small glass to each guest with the canapés. The mains are rich but still fresh with lots of crisp textures. It is cherry season here and organic cherries are beautiful right now. So duck loves something both sweet and a little sour to cut its richness, plump cherries doused in orange juice with a glug of good, preferably aged, balsamic vinegar is the perfect thing. I wouldn’t use the caramelised balsamics, I find those way too thick and overly sweet. Safe and happy holidaying all, may every mouthful you share bring you and those you love, joy and deliciousness. Me and Sandor whilst sampling homemade miso and koji’s, brought to his fabulous workshop by a chef from Momofuku restaurant. I was introducing the idea that there is a tasting ‘spoon’ on the top of our hands, if you raise your thumb food sits nicely in the hollow created and there is then no need to wash up cutlery. Sandor introduced me to the notion that there is no need to have more than two tasting cups for a group of 100 or so folk! I haven’t adopted that but it did highlight how precious we can be these days around hygiene. I was fortunate to be asked by Kristen and Nick from Milkwood, who brought Sandor out for that tour of the East Coast, to make some of the ferments needed for his workshops. Doing so has enriched my offerings in my new book, as I had not previously dabbled in the making of lightly alcoholic drinks. I discovered how much fun it is to watch yeasts move into a brew and how easy they are to produce, for deliciously refreshing results. You will find local honey mead, Scrumpy apple cider and Peach and apricot fruit wines amongst the many other good things within. The process goes like this, get ripe unblemished fruits, steep in water, add a source of sugar, stir and stir and stir until it bursts into effervescent life, contain with an airlock, wait, decant and drink or brew further. Them the basics but for many more distinctions you might like to buy my book! A confluence of events can lead to the river of loss and then too easy to be true pumpkin soup! Last night I wrote the date on something as August 12, I had fleeting connection that the date was important somehow but I didn’t take the time to know why. I was too busy sorting out a cupboard and had just broken a precious bowl, which holds many moving memories for me. 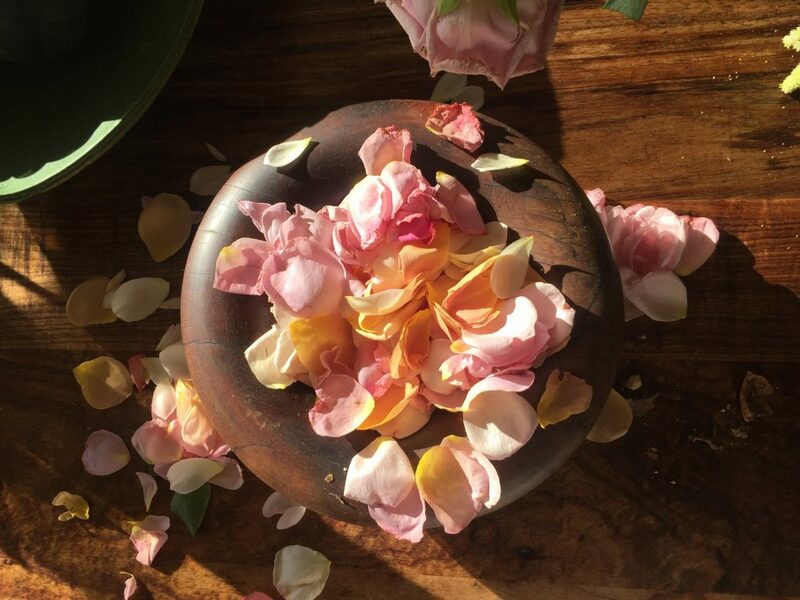 My co founding partner of Iku Wholefoods, Willem Venter made that bowl after he had gone blind, not long before he died in the Blue Mountains in 1991. I felt the upwelling sting of grief that lies just beneath the surface and which, the crashing of china can surely loose. I made a cup of rooibos tea the way Willem did and I choose to see the breakage as an opportunity to me for letting go then I got on with my work. I was wrangling computer program issues, writing a newsletter and taking several orders for my book. Then I saw an order from B who was an early adopter of our food. B is South African and shares that heritage with Willem, they adored one another. We have seen each other sporadically and not for some long time now. We exchanged emails and I learned she now has 5 grandchildren and we spoke of the passing of time. I spent another moment not thinking too hard about that, for fear of the flood gates opening. I realise now I was a day out as I see that today is August 12th. I saw this in the lovely early morning light, while the magpies were calling up the dawn and business had not yet taken over my being. August 12th is the day, at the age of 33, I and a small group of family and friends sat with Willem while he died. I was scrubbing a pot in the kitchen at the moment of his death, somehow that feels very apt. I spent some time with him and then I walked out into our garden in the chill mountain air at dusk and listened while the black cockatoos and the currawongs called him away. 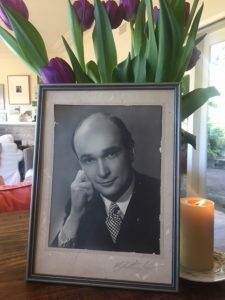 Twenty six years on Willem is still a daily part of my thinking, feeling, cooking and surroundings and clearly the river of loss is never far away, though it has a sweetness now that it did and could not then and ultimately it guides me to gratitude. He and his partner and so many others I knew died far too young, at the hand of AIDS. It took me years to find an empowering context for this loss of vibrant powerful life, friendship and potential. I encounter many people still who were customers of ours, whose lives were also touched by Willem; they recount charming tales and we laugh together and I am reminded to be grateful for the six short years that have so positively influenced my life. I choose to believe that his and the deaths of other young people serve to make those alive, more appreciative of the life we have and reminds us to live more fully into our own potential. I could not bring myself to throw away the pieces of that bowl, they are resting in the laundry where they sit like a time bomb threatening me to feel. I have felt a pang each time I have passed and then been amused, thinking that if Willem were here, he would be oh so clear about what should I should do with those shards ‘chuck them out doll, it’s rubbish now’ and so, quite soon, I will. If you’d like, you can view a video of Iku’s history here. 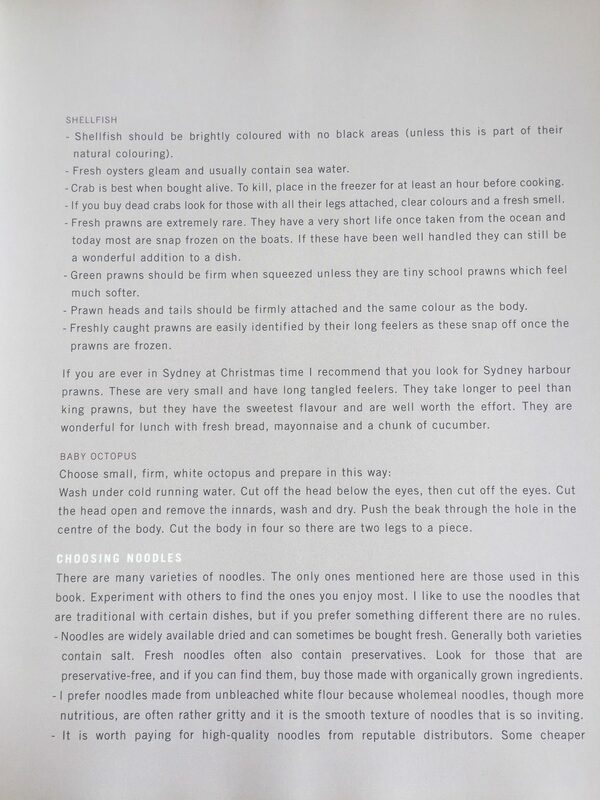 Because I think that each post should bear some relevance to food, here is a description of the first meal Willem cooked me in March of 1985. We ate in his kitchen in his oh so stylish apartment in MacMahons point, the table was set beautifully and the napkins were crisply laundered. The first course was a lovely big bowl of butternut pumpkin soup with a hint of orange zest, we then had a wee Golden nugget pumpkin filled with grain and a sauce of some description and for dessert we had… spiced pumpkin pie. Clearly it was Autumn and Willem loved pumpkin, but the funny thing was that he hadn’t realised! 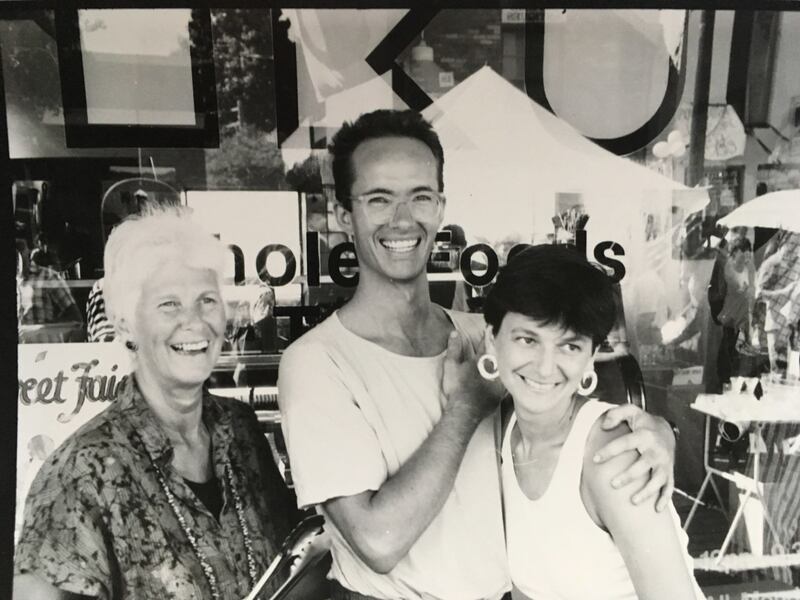 When we opened the doors to Iku Wholefood on September 17th 1985 we had never cooked together. We were clear though that in the running of the business we would share the tasks fifty fifty, I had more experience in the kitchen and he in the office, we pooled our resources and our heartfelt wishes to demonstrate how great simply made whole foods could be and there was born a business that exists today thanks to Ken Israel who was my business partner from the time Willem died (I sold in 1997), in 14 locations in Sydney. May I say, ‘be bold and follow your wildest dreams, no mater what’. Rub the whole pumpkin with ghee then place it on a baking tray and transfer to the oven at 150˚C to cook for 1½ -2 hrs or until a sharp knife slides through the flesh with ease. Remove from the oven and then cut out the centre and scoop out all the seeds. Cut the lot or if the skin is tough, scoop the flesh into the blender and blend with sea salt and more ghee to taste and enough stock to make a pourable but thick soup. Re heat and serve hot topped with fresh parsley, fine cut lemon zest or ginger and gomashio. Great with fresh sourdough and grass fed cows butter.